High-Back Executive Chair Features Bonded Leather Upholstery For A Luxurious Seating Experience On Extra-Soft, High-Density Foam. The Fixed Arms Are Also Padded And Upholstered In Matching Pvc So You Can Sit Back And Relax. Arms And Frame Feature A Wood-Look Hydro Sublimation With A Walnut Finish To Match Your Decor. Customize The Chair For The Ideal Position With Comfort Functions Including Pneumatic Seat-Height Adjustment (3-1/2" From 20-1/2" To 24"), Back Tilt, Tilt Lock, Adjustable Tilt Tension And 360-Degree Swivel. 27-1/2" Nylon Base Is Equipped With 2" Hooded, Dual-Wheel Casters For Easy Chair Movement. Seat Measures 19-1/4" Wide X 17-3/4" Deep. Back Size Is 22-7/8" Wide X 24" High. 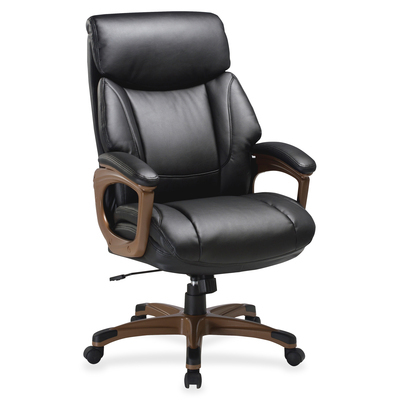 Weight Capacity Is 275 Lb..
High-Back Executive Chair Features Bonded Leather Upholstery For A Luxurious Seating Experience On Extra-Soft, High-Density Foam. The Fixed Arms Are Also Padded And Upholstered In Matching Pvc So You Can Sit Back And Relax. Arms And Frame Feature A Wood-Look Hydro Sublimation With A Walnut Finish To Match Your Decor. Customize The Chair For The Ideal Position With Comfort Functions Including Pneumatic Seat-Height Adjustment (3-1/2" From 20-1/2" To 24"), Back Tilt, Tilt Lock, Adjustable Tilt Tension And 360-Degree Swivel. 27-1/2" Nylon Base Is Equipped With 2" Hooded, Dual-Wheel Casters For Easy Chair Movement. Seat Measures 19-1/4" Wide X 17-3/4" Deep. Back Size Is 22-7/8" Wide X 24" High. Weight Capacity Is 275 Lb.